120 years ago, on April 3 (25), 1895, Emperor Nicholas II decreed the foundation of the Russian Museum in St. Petersburg. RBTH looks back at the history of the city’s greatest repository of Russian fine art and finds out how the museum is continuing to expand and develop as it strides into the 21st century. Moscow was always a merchant's city, Petersburg – an imperial one. This distinction can be seen even in the cities’ museums: While Moscow’s Tretyakov Gallery was established in 1856 by merchant Pavel Tretyakov as his private collection, the Russian Museum in St. Petersburg was established by decree in 1895 by Tsar Nicholas II in fulfilment of his father's wishes and was called the Emperor Alexander III Russian Museum. On April 25, the museum, officially opened in 1898 in the specially purchased Mikhailovsky Palace, marks the 120th anniversary of its foundation. In the 12 decades of its existence, the State Russian Museum has established itself as one of the country’s greatest storehouses of Russian art, with a pedigree to rival that of its more illustrious Petersburg counterpart, the Hermitage, and one of the world’s finest collections of art by members of the various movements that made up the Russian avant-garde of the early 20th century. To celebrate its 120th birthday, the museum is preparing a special commemorative exhibition titled "Gifts and Acquisitions," which will feature 19th-century works acquired by the museum since 1998. Visitors will be able to admire paintings by Russian masters such as Borovikovsky, Aivazovsky, Repin, Shishkin, Goncharov, Kustodiev, Serebryakov and others. “It's a great place to discover unknown Russian artists. Nikolai Roerich, Arkhip Kuindzhi and Pavel Filonov really impressed me. The main building, the Mikhailovsky Palace itself is also very beautiful." From its beginnings as a single building, today the State Russian Museum has become an entire artistic complex. The expansion began in 1914-16, when architect Leon Benois added a new wing to the main building that today bears his name, and resumed in the early 1990s with acquisition of the buildings of the Mikhailovsky (Engineers') Castle, as well as the Marble and Stroganov palaces. In 1995, the Marble Palace became home to the Ludwig Museum, created with the donation of 118 pieces of international contemporary art by German collectors and patrons Peter and Irene Ludwig to show the evolution of art in the 20th century. At the beginning of the 21st century the museum acquired the Summer Garden and the wooden cabin of Peter the Great, one of the first structures to be built in St. Petersburg. In 2003 the museum began opening virtual branches, 37 of which operate abroad. Since 2011 the London branch has operated in Pushkin House (the British capital’s longstanding Russian cultural center), where the visitor can get acquainted with the multimedia programs dedicated to Russian art prepared by the museum's collaborators. Recently, the museum expanded physically once again: On March 25 its first foreign branch was inaugurated in the city of Malaga in southern Spain. The Russian Museum's next step will be Cuba. "It has been agreed on a ministerial level that a building in Havana will be provided for the Russian Museum House," said the museum’s director Vladimir Gusev in an interview with RIA Novosti. "The agreement was then confirmed during a meeting between Vladimir Putin and Raul Castro. In May we are flying there to open the virtual electronic Russian Museum." "I think [it] is even better than the Hermitage! There I saw so many unknown images of ancient times in Russia, it is really a window to the past. Of course the building is not so interesting like the Hermitage but it is very interesting for people from abroad." Among the first displays in the Mikhailovsky Castle at the end of the 19th century were paintings brought from the Hermitage. They included "The Ninth Wave" by Romantic painter Ivan Aivazovsky and "The Last Day of Pompeii" by Karl Bryullov, whose work marks Russian painting’s transition from Neoclassicism to Romanticism. 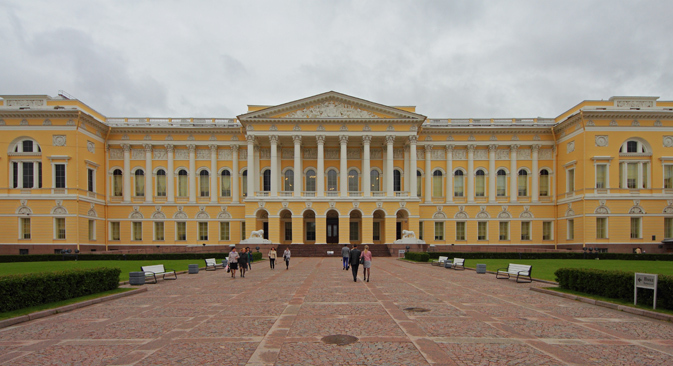 Ironically, with the fall of the Russian Empire, the former imperial museum came to own things that had belonged to the tsar's family and their entourage (for example, to the aristocratic Stroganov and Sheremetev families), as well as works of ancient Russian art from monasteries. The museum is especially proud to contain works from two great icon painters: Andrei Rublev (icons from the iconostasis of the Dormition Cathedral in Vladimir) and Dionisius (icons from the iconostasis of the Cathedral of the Nativity of the Virgin in the Ferapontov Monastery in the Vologda Region). "I was there last summer. I literally spent one hour in the room of religious symbolist Mikhail Nesterov. The portrait of Sergius of Radonezh just blew me away. I’ve seen that in books dozens of times and it was awesome to see in person." After the Russian Museum created a section for new artistic trends in 1926 (when it acquired practically the entire collection of the Museum of Artistic Culture that had been established by avant-garde artists and subsequently closed by the Bolsheviks), the museum began collecting contemporary artworks, from Symbolism to the Russian avant-garde. One of the museum’s greatest draws is its collection of art by Kazemir Malevich, the key avatar of the Suprematist movement he founded around 1913 – including his groundbreaking “Black Square.” Malevich's descendants donated many of his works to the museum (156 in total), some of which have been displayed in exhibitions in Stedelijk in Amsterdam and the Tate Modern in London. The Russian Museum also boasts a number of works and notes by experimental artist and member of the Russian avant-garde Pavel Filonov. These pieces were brought to the museum by his sister after Filonov perished during the Siege of Leningrad. Besides Malevich and Filonov, the contemporary section includes masterpieces by well-known artists such as Wassily Kandinsky and Marc Chagall, as well as acclaimed figures such as painter and set-designer Sergei Sudeikin and Soviet painter Kuzma Petrov-Vodkin. "My tourists are usually most drawn to the modern works displayed in the Benois Wing. Works by Malevich, Malyavin and Nesterov are what's unique about Russian art, given that before we mostly followed European traditions. However, one of my guests was once enamored with a 19th century sculpture. He wandered away from the group and was found next to 'The Russian Scaevola' (by the Russian sculptor Demut Malinovsky), trying in vain to match the pose of this huge warrior. It was quite a sight." The Russian Museum continues to acquire new pieces, with its collection today numbering more than 400,000 works, according to the museum’s press office. As it heads confidently into the 21st century, the future for this august institution and national treasure looks undoubtedly bright.